A permit isn't automatically required to build an on-grade patio, whether it's concrete, brick or any other material. Requirements vary widely in local governments, ranging from relaxed to stringent. Check with the local authority as to whether a permit is required to build a patio. Most jurisdictions make a distinction between on-grade and raised structures. The height considered above-grade differs widely in municipalities. In some cases a permit may be required beyond a given size limit. Another exception is where there are restrictions on development in the zone, such as an environmental protection zone, or excavation concerns. Structural alterations to the house generally trigger the need for a permit. If the patio will be enclosed or covered, a permit is probably required. This would include adding a door to access the patio. Changing a door, but using an existing opening does not require a permit. 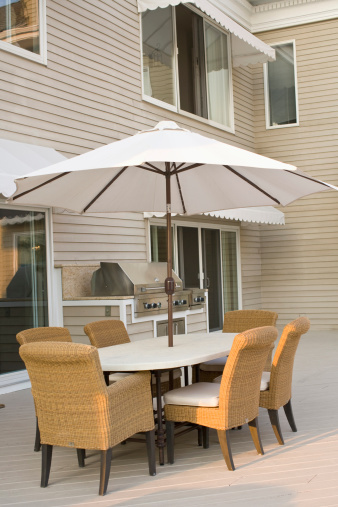 Adding provisions for patio lights may require an electrical permit. Structural alterations require a building permit. Alterations to the exterior of the house are land-use zoning issues. In some areas there may also be site specific issues that lead to restrictions. Check your local codes before assuming that no permits are needed for the patio or associated construction activities.